Keep your tone up � be successful on Forex! Speaking about Oleg Taktarov, sport gave him the experience of vital importance, he learned discipline, fast reaction and strong will. These traits of character were most essential for his becoming the winner of the World Ju-Jitsu Championship, as well as of numerous mixed fighting contests in the USA, Japan and Brazil. The attainments in sports and the reputation of the "Russian Bear" were a pass for Taktarov to Hollywood. Oleg is sure that everything you do is either to be done perfectly and fully, or not to be started at all. That is why between training and working the fighter studied in one of the most famous actor academies in the USA "Playhouse West", where he learned the basis of acting. This is the way his career of an actor has begun, which now includes over 40 movies shot in the USA as well as in Russia. Nowadays Oleg Taktarov acts in movies, is a TV shows presenter, heads a producer company, works as a Sports Advisor in the Administration of Nizhni Novgorod (Russia), gives master classes on self-defense to children, and also writes books. 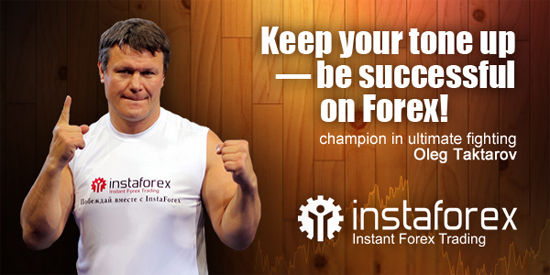 The moral values of the sportsman, his active position in life and readiness to defend his honor triggered InstaForex Company to offer Oleg Taktarov to be the face of the brand, as well as the client of the broker. Thus recently the sportsman has got wise to the currency market, but he has already become an active trader of the company, being confident of scoring another victory in his life on Forex market.